Correct jump ring opening and closing technique must be followed to ensure the rings maintain their original shape. Jewelry jump rings are used extensively in beaded jewelry making and are most important not only for joining items together but in giving hand made jewelry a strong and neat finish. Earrings, bracelets, necklaces, chain maille jewelry and charm bracelets are items that may use a lot of rings in their construction. It is most important that rings retain their shape so that the jewelry creation is neat and well finished. When opening rings they must not be pulled apart as it will not be possible to close them correctly. The following stages should be followed to ensure that the shape is retained and that the ring is closed properly. 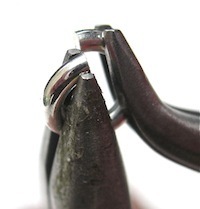 Hold the ring in a pair of pliers, using a second pair of pliers grasp the ring, move your hands in opposite directions until the ring opens up. Do not pull outwards with the pliers. You are actually twisting the ring ends apart to open the ring. Closing the the ring is the reverse of the above method. Hold the ring with both pliers and again move your hands in opposite directions, move the open ends past each other. The ends are moved back and forth until the ring is closed. 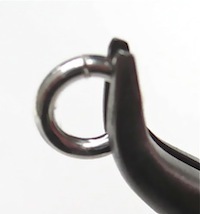 You will need to exert inward pressure on the pliers so that the ring begins to close. As you move the ends past each other, exerting pressure, you will hear a click as the ring closes. Don't try to force the ring closed. Check to see that the ring has closed without a gap and that both sides are level as per the photo below. 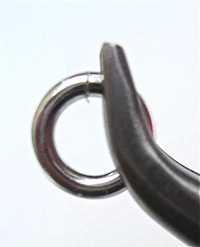 When closing rings always double check to ensure they have closed completely and are level on each side. Double checking rings is most important if your hand made jewelry creation has many rings in the design such as chain maille jewelry. You can buy a special tool for opening rings. It is a wide finger ring with a slot cut into it. You slip it onto your finger, put a ring into the slot and twist it open.